The 90th Anniversary of the joining of the Free Church of England and the Reformed Episcopal Church in 1927 in Wallasey. 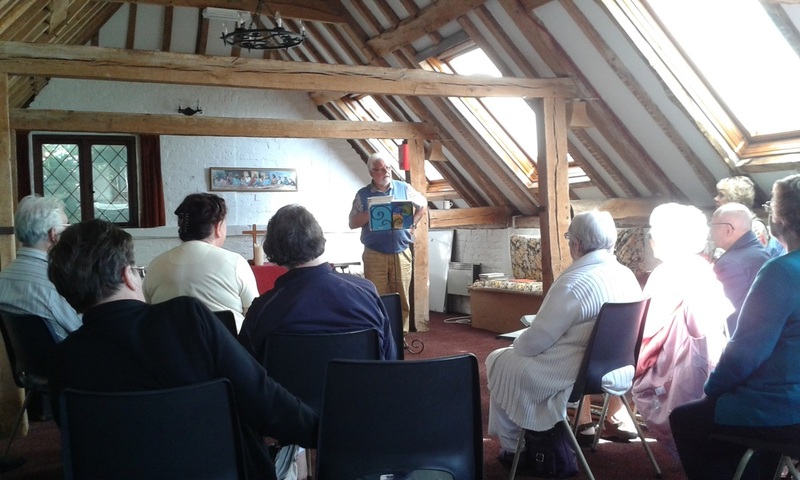 Our Church Away Day 2015 to St Mary’s in Newick, in East Sussex, was a great success with 22 attendees. All enjoyed a day of fellowship, prayer & worship. 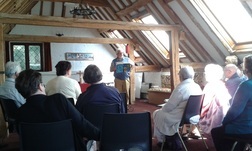 Some of the congregation are pictured below up in the Old Barn, with Revd Gerald Kirsch giving a presentation on the Holy Spirit. It was our 3rd Anniversary and Harvest Festival Service on 18th October. It has always been a popular service and this year it didn’t disappoint. Assisted by Revd Michael Blades, Mr Douglas Raine and Mr Alex King, Revd Gerald Kirsch preached to a full house of 39 people. 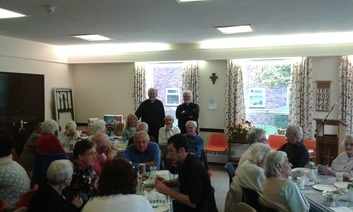 We all enjoyed a ‘bring and share’ luncheon after the service. 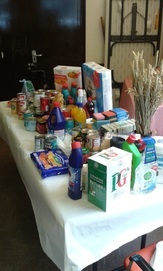 As with last year, we supported 2 local charities, The Southlanders and The Worthing Churches Homeless Project. The fresh produce was auctioned off to the congregation present, raising £100.05 for The Southlanders. Services in Swedish will be held on the first Saturday of the month, beginning 2 May 2015, and held at St Martin's in the Bull Ring, Birmingham, starting at 2pm. There will be time for coffee and a chat after the services. Please contacct Revd Gustaf Stenstrom for further information. 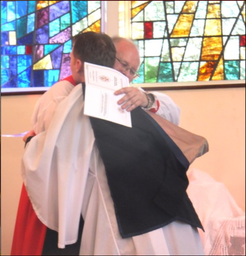 The Revd Michael Blades was ordained to the Presbyterate on 21 March 2015 at St Francis Church, Shoreham-on-Sea. It was certainly worth the journey. We were fed physically and spiritually and Michael was thrilled with his special day. 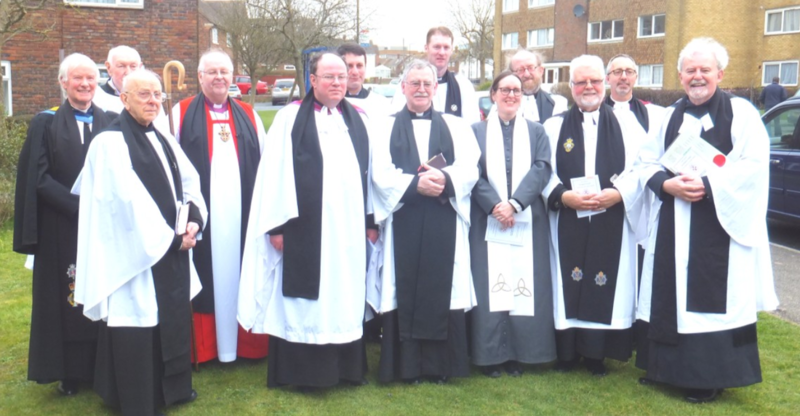 It was a lovely day both outside and inside for Mark’s Ordination to the Presbyterate on Saturday 7 March 2015, at St Andrew's Church, Bentley. Mark was thrilled with the support from St Andrew’s and from around the diocese. The Revd Gerald Kirsch and his wife, Rosemary had driven up from the south coast to be with us. Barbara Wilson had made another wonderful creation. It was a sponge cake made to Queen Victoria’s birthday cake recipe and was delicious and so beautifully made. 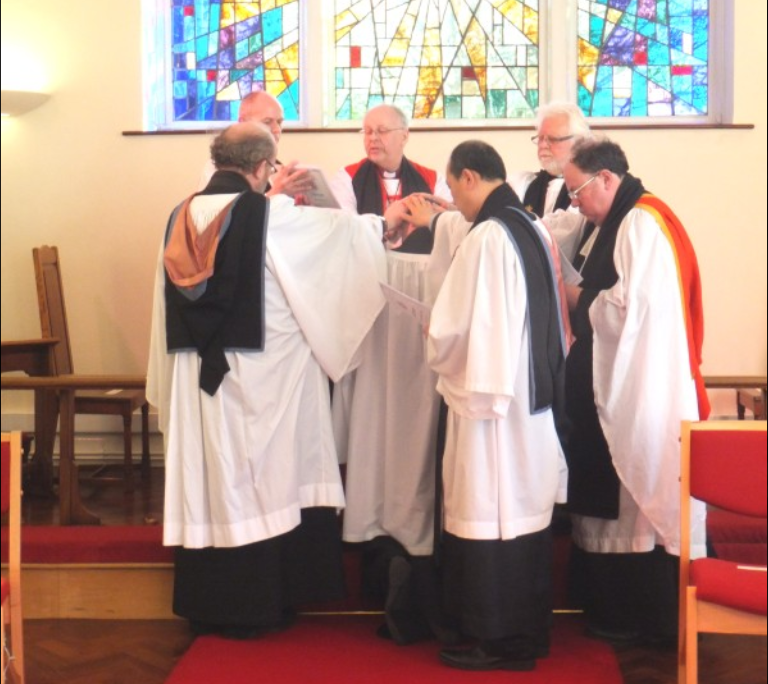 Bishop Paul was also assisted by the Revds Robert Wilson, Dr Mark Gretason, Daniel Choe, Gustaf Stenström and our very own Paul Reynolds and Colin Hunter. The buffet too was lovely with meat platters rather than sandwiches for a change and lots of other goodies. Bishop Paul wishes to thank everyone who helped make Mark’s day such a joy and a pleasure. We were truly blessed. 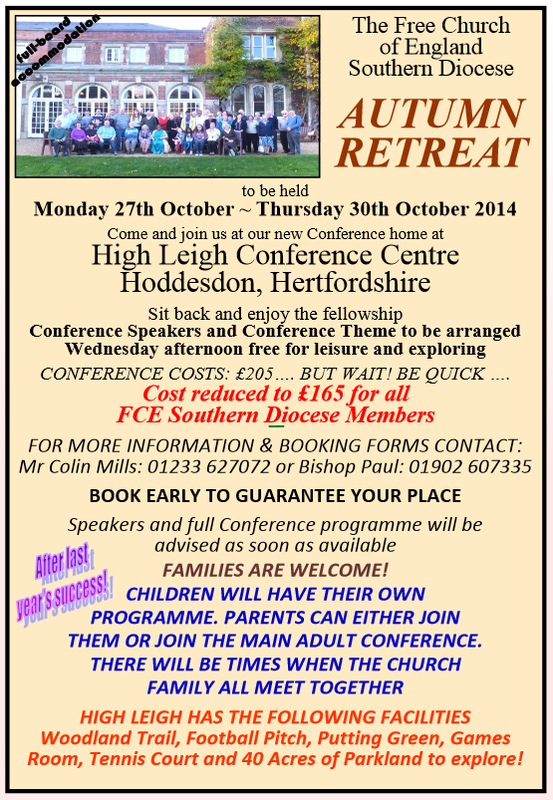 The annual Southern Diocese Clergy Conference was held from 9-11 February 2015 at to High Leigh Conference Centre near Enfield. There were sixteen ministers and also some wives in attenance. The meetings began with a Holy Communion service on the Monday evening lead by Bishop Paul and the sermon given by Revd Gerald Kirsch. Revd Colin Hunter led the morning devotional service, assisted by the Revd Gustaf Stenstrom. The conference theme was ‘The FCE, what it means to me.’ There were several subjects discussed about our Evangelical, Episcopal and Liturgical nature that gives the FCE its identity, each session being lead by one of our ministers before being opened up for further discussion. 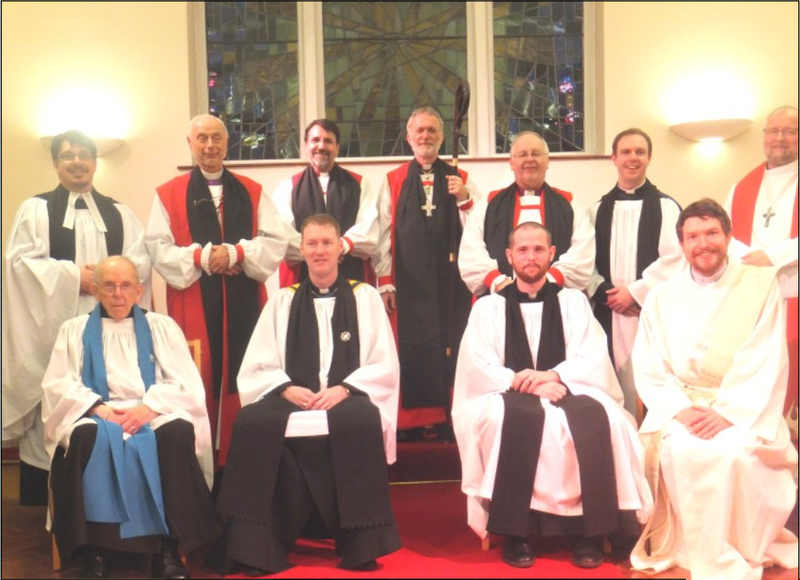 Over eighty members and friends gathered for the ordination of the Revd Colin Hunter to the Diaconate during the evening service on 23 November 2014 at St Andrew’s church, Bentley. Revd Colin thanks everyone for their support and encouragement over the years to bring him to this important commitment to his Lord and his beloved church. All present were well fed spiritually by the Revd Paul Reynolds' sermon and physically with the buffet that followed and the beautiful cake made by our dear Barbara Wilson from Christ Church, Harlesden. Well done, Colin. 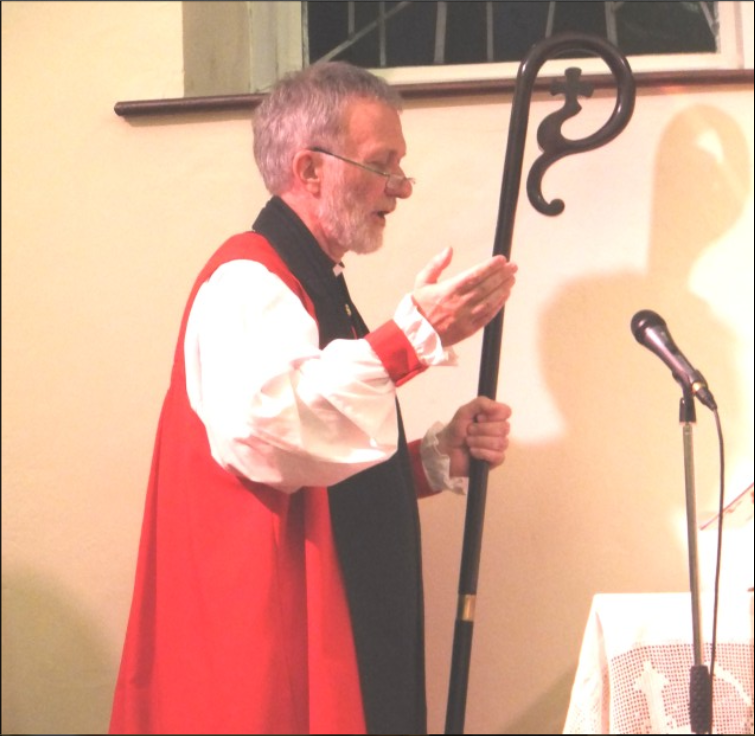 Bishop Josep Rossello of the Reformed Episcopal Anglican Church of Brazil (part of the Free Church of England) was conditionally consecrated during theevening service held at St Andrew's, Bentley, on 28 September 2014. Bishop Primus, Rt Revd John Fenwick, led the service and was assisted by Bishop Gerhard Meyer of the Reformed Episopal Church in Germany, and Bishop Paul Hunt, Free Church of England Southern Diocese. Other visitors from around the Northern and Southern Dioceses were also present. The service was followed by a buffet supper. 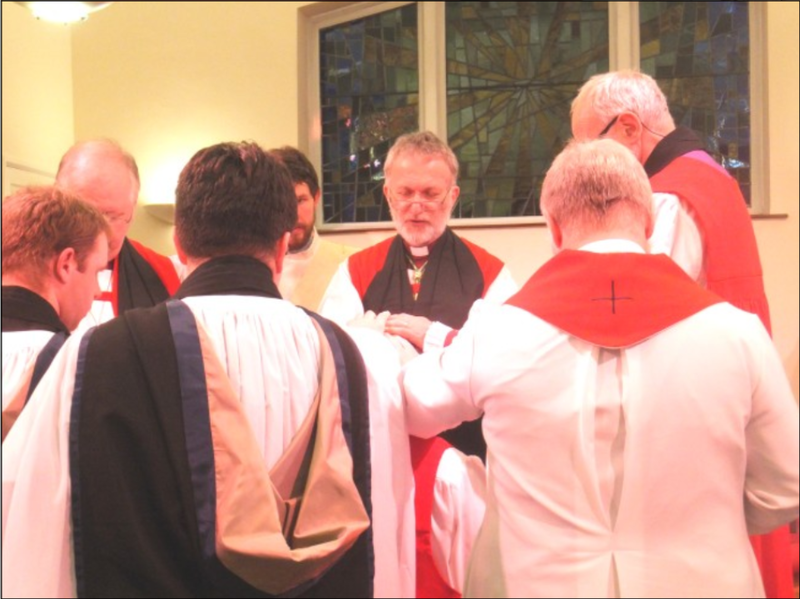 This was a very rare service, the first in the Free Church of England for eight years. The photo on the left was taken at the actual moment of consecration when all Bishops and ministers laid their hands on Bishop Josep. What's going on this coming weekend, 6-7 June 2014 at Christ Church, Exmouth - Pentecost Weekend! This is an opportunity to come to be inspired and equipped to prophesy by one widely regarded in the Body of Christ as a Prophet. For many years Bryn was the 'in house' Prophet on the International Council of Salt & Light Ministries which includes many hundreds of Churches around the world. Having first met Bryn in the 1980s, I have personally been blessed and encouraged by his ministry. In these last days, God has much to say to His people. Paul urged the Corinthian Christians to 'earnestly desire spiritual gifts, but especially that you may prophesy' - his words are no less true for us today, especially as we are living in those last days spoken of on the day of Pentecost. The Christmas season for me is very different this year. 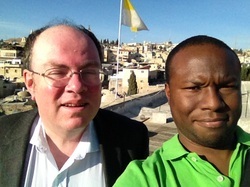 One of my church members and I undertook a short pilgrimage to Jerusalem, staying in the Old City on the Via Dolorosa. This is the very route on which Jesus carried the Cross from judgement to Calvary. It is barely wide enough for single traffic. It narrows on the ascent to the site of Golgotha where stands the church of the Holy Sepulchre. Levelled over the years so that the hill top is obscured the effect is that the traditional site of the tomb is at the same level. Both sites were ‘without a city wall’ as the walls were rebuilt later as Jerusalem expanded so that it feels a very enclosed area now. Other parts of the city of Jesus’ time are more obvious than these. The pool of Siloam, some tombs adjoining Kedron’s dry valley, the water conduit built by Hezekiah which was several hundred years old when Jesus was walking the earth, the ‘wailing wall’ of Herod’s Temple, and what remains of the Olive groves on the Mount of Olives. The throng of the people is much the same as it must have been. Armed police and soldiers and barricades reflect the tinderbox nature of the place which at the same time felt safe. The pressure on Pilate to stop a mob causing mayhem and chaos is replaced by present problems. One is reminded how quickly neighbours can turn on each other as indeed they did in Bosnia a few years back. Perhaps the importunate are more sophisticated than the beggars of old but the same sad grasping of the greedily desperate or merely greedy is to be encountered. The actors are different but the roles are the same. No wonder Jesus turned to the Mount of Olives to teach, for quiet and contemplation. 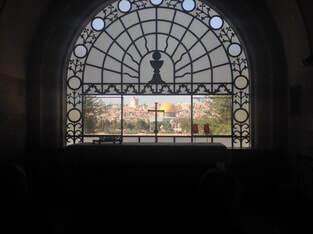 A church marks the place where Jesus wept over Jerusalem. Through its plate glass window can be seen the Islamic dome, a sad reality, but a group of pilgrims were singing ‘Blessed Assurance’ outside. 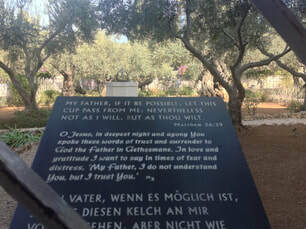 At the base of the hill almost within site of Caiaphas’ house where Jesus was taken after His arrest is the Garden of Gethsemane. For me this was the most moving site where Jesus must have felt truly alone. Not long after came the dereliction of the Cross. Unlike many English churches most people in the churches were at prayer and almost all were in quiet silence ‘in heaven for half an hour’ Living in cosmopolitan London though I do I felt very strongly the world wide scope and multi-faceted shape of the Christian religion. It is anything but moribund let alone dead. English religion is sedate and understated. It seems very foreign to see kissing of stones, touching of objects onto a stone upon which it is said the body of Jesus was prepared for burial but even our own expressions of faith are physical whether we sing or speak and Jesus Himself takes physical things like water, bread, wine, to cleanse, touch and feed us. I pass to the present tense not only because Christians acknowledge a living and acting Christ but because the gap between Jesus of Nazareth and 2013 narrows so remarkably that it is like it all took place only the day before yesterday. Black and white give place to colour and colour becomes high definition. Or you might consider it an unveiling. In Journey of the Magi by T S Eliot the narrator remarks of his pilgrimage that there he felt a change had taken place in them ‘no longer at ease here in the old dispensation’. So it is. 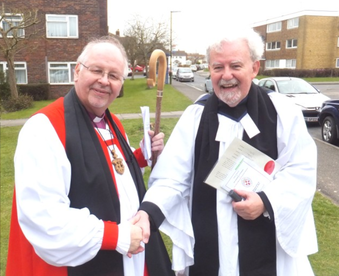 Rt Revd Paul Hunt, Bishop of the Southern Diocese, undertook the long journey to Shoreham-by-Sea to licence the new church. Bishop Paul had several tasks to complete whilst he was there. The first was to Licence the Revd Gerald Kirsch as the Presbyter-in-Charge and Licence their new Reader, Michael Blade. The Wardens and Church Council had to sign the Official Declaration and were officially welcomed by the Bishop. A Licence was given to the church which authorised them to conduct Divine Worship in the name of theFree Church of England. It was good that the Diocesan Secretary, the Revd Ron Talbot, was also able to attend. This is the first new Free Church of England for 70 years; the last one to be created was St Andrew's Church, Bentley, in 1943. The service went very well in their present home for the church, which is a small community room. "There is so much to say about my trip to Croatia. Let's admit it, who would have known much about where Croatia is, let alone some of the tragic recent history. The Serbian/Croat war left many buildings in ruins. On a happier note, I was there to help Consecrate Jasmin Milic as a Bishop for the missionary churches in Croatia. The Consecration was a joy and an honour to have been part of. The church was packed to the rafters and the national television company broadcast part of the service. "I must admit that I can't wait to visit Croatia again. There's a real zeal for the Lord and the work of the labourer there is never wasted or a burden." For more details and photographs, please click on the image. 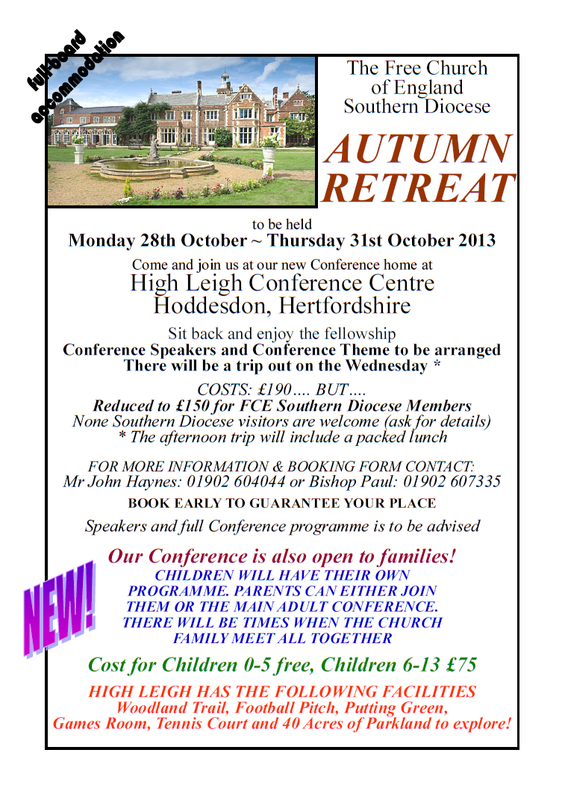 The Conference is an annual event, held since the late 1980's at Sunbury Court, the Salvation Army headquarters. Our churches are widely spread around the south of England, so this event is a good opportunity for us to share with each other, enjoying fellowship, sharing our news and also Christian themed discussions and Bible study. This year we enjoyed talks on the Epistle of James, Community, Devotion & Mission, Bishop Gerhard Meyer's English Camp in Germany and we also had a trip to the Brooklands Transport Museum. Everyone who attended had a fantastic time and we look forward to expanding our conference for next year, which will also hopefully include a celebration of the Free Church of England's 150th Anniversary. Some highlights of the Conference are to be seen in the photos below.